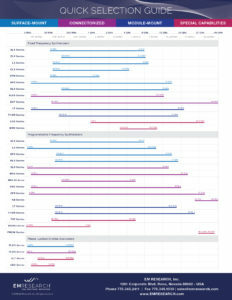 The full spectrum of our innovative products. 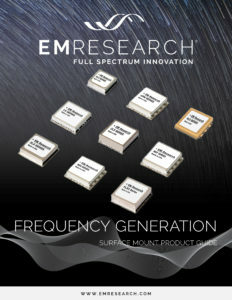 The surface mount devices from our frequency generation product line. 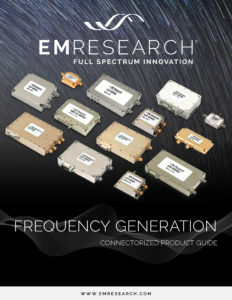 The connectorized devices from our frequency generation product line. 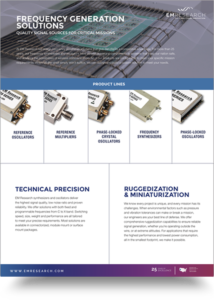 The devices from our signal conversion product line. 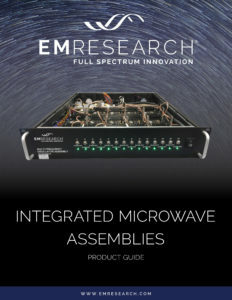 The devices from our integrated microwave assembly product line. 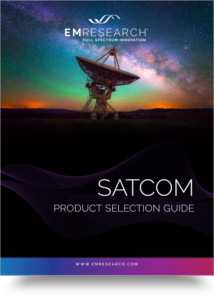 Showcasing our capabilities in the Satellite Communications Industry. 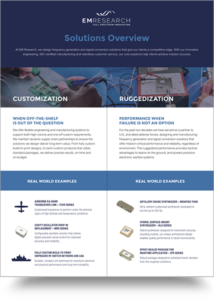 Explore a high level overview of our ruggedization white paper, explaining how to ensure performance under the toughest conditions. 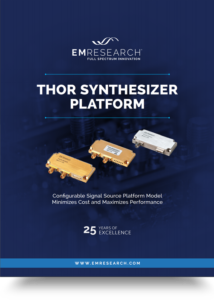 Read a high level overview about our THOR series executive summary. 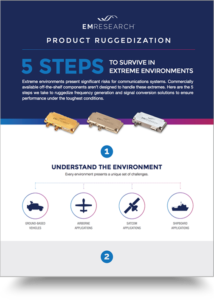 View our infographic illustrating the 5 steps to properly ensure performance under the toughest conditions. 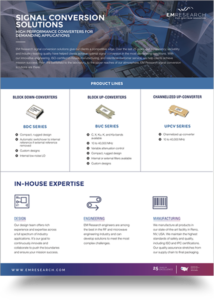 Statements regarding our commitment to excellence in supplier selection. 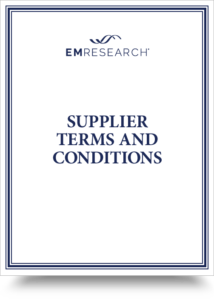 Our standard terms of purchase for all suppliers. 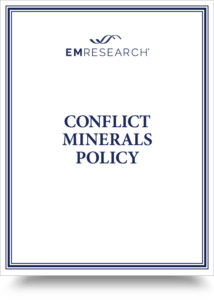 Statements regarding our commitment to responsible minerals sourcing. 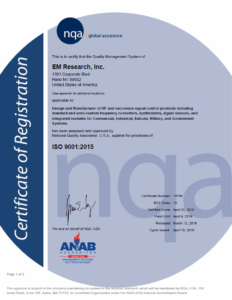 Current ISO Certificate for EM Research. 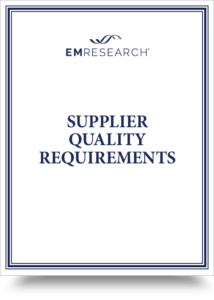 Learn about EM Research capabilities in our corporate overview. 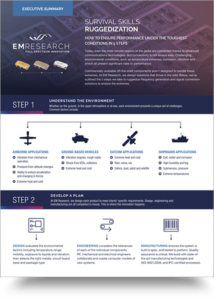 Learn more about EM Research capabilities from our engineer, design and manufacturing teams. 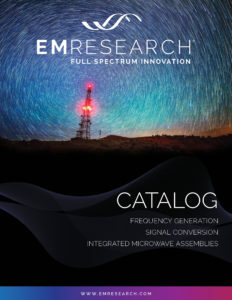 View the EM Research product selection chart to learn more about product frequency ranges. 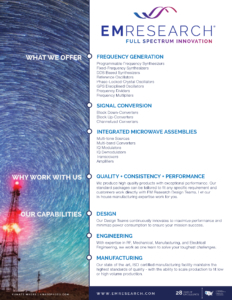 Find out how our frequency generation solutions give our clients a competitive edge. 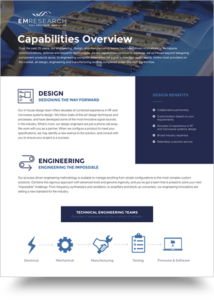 Read a high level summary of how our core solutions help clients achieve mission success. 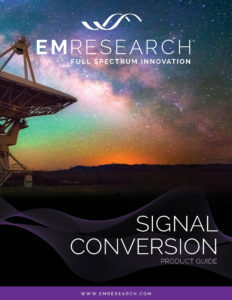 Find out how our signal conversion solutions give our clients a competitive edge. 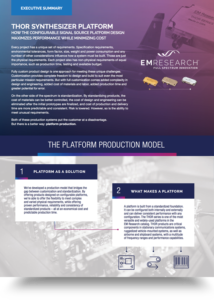 Learn about a configurable signal source platform design for minimizing cost and maximizing performance. 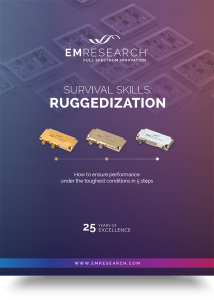 Discover our ruggedization white paper and learn how to ensure performance under the toughest conditions.